Janne Dugstad started working in the university college in 1994 and was for many years Head of Department and Dean of Optometry and Visual Science. 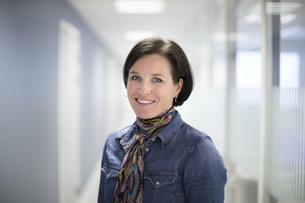 She has since 2006 been central to the college's commitment to health innovation in the Drammen Region and has during this period been Chairman of the incubator DRIV AS, of the arenaproject Arena Health Innovation and later of the Arena Health - Research and Innovation. She has been the Director of the Science Centre Health and Technology since 2012. Have worked with reduced vision and hearing in the elderly and in people with mental retardation. In recent years, projects have included healthinnovation and the development and implementation of welfare (health) technology, and Lean municipal health- and care services. Dugstad, J., Nilsen, E. R., Gullslett, M. K., Eide, T., & Eide, H. (2015). Implementering av velferdsteknologi i helse- og omsorgstjenester. Opplæringsbehov og utforming av nye tjenester - en sluttrapport. HSN Skriftserien.